“We long for the land,” she said. “The soil of home.” Anise chatted with us in the sitting room, one hand cradling a cup of coffee, the other steadying her infant daughter. Her parents had fled war in a neighboring country, when Anise was not much older than her baby is now. Her identity is bound up in a land she only knows through her family’s stories, of Palestine. Anise retold her stories of woe and hunger for homelands with a flair that, from the surface, bordered on cheerfulness. She introduced us new listeners to her decades-old tales with great animation. Zaina’s face, however, grew cloudy, then dark. She burst into tears and ran into the kitchen. Gathering tissues, Anise said to us in a matter-of-fact tone: “She fled Syria only eight months ago. It’s difficult. We all long for our lands.” And she went to the kitchen to pursue Zaina. 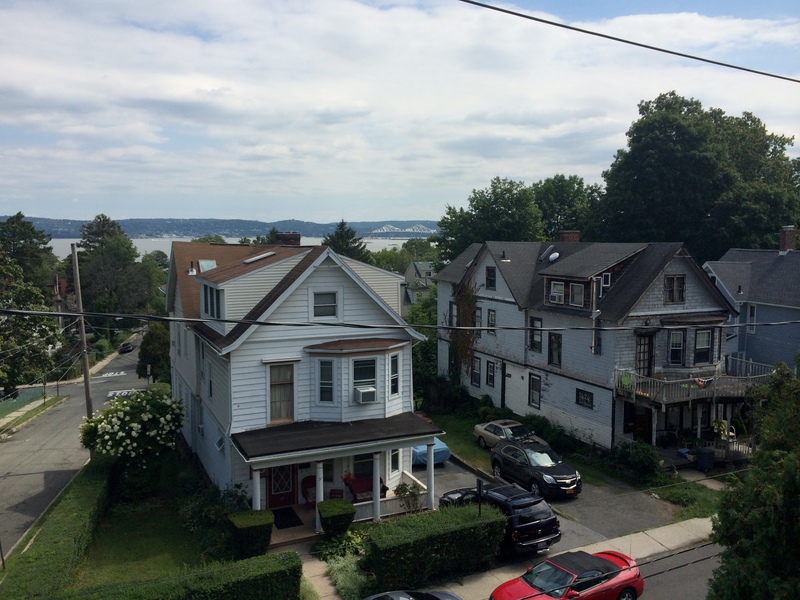 My second-story view this week is from an apartment in the United States, where I am staying with good friends. We are grieving the transition of a beloved woman of faith from this life to the next. Her husband sent me a text in the weeks leading up to her death, letting me know specifically that he was praying for me. Upside-down, isn’t it? The displaced being hosts. The grieving giving prayers. The wounded bringing wholeness. Since moving eight months ago, I have become an adult who needs to re-learn communication; a member separated from a body; an extroverted person who spends great portions of time in quiet. For I was hungry for companionship, and an Arab family asked me to spend every night of their holidays with them, eating and playing games. I was thirsty for knowledge of the language, and new friends patiently repeated themselves until my mind was sated, unable to hold more. I was sick, and the women in the community center’s wellness program offered seven different cough remedies. I was a stranger to their country and their language, and they kept pouring coffee and urging me to eat more, kept insisting that I remain with them. Last month, a family of Syrian refugees invited some friends and I to their home. From the second story of an apartment building on the border, they have watched and waited more than a year for stability to return to their homeland. Over the elaborate meal they fed us, we asked them about rent and employment and heard the story that had become familiar: high rental costs, no jobs. Back at Zaina’s, while Anise was comforting her in the kitchen, I had thought about the night before. I had been alone in my house, crying out homesick and longing for my own “land.” And I realized that with my decision to move here, I was sensing some type of hunger, thirst, and what it meant to be alone– and that Zaina, and my other friends who have been displaced by war and division, experienced that pain with much less choice and a far greater depth. Yet they were the ones feeding me, helping me learn the language, and inviting me into their families. I carry them in my heart for these days that I am visiting in the United States. They exist on the borders, uncertain of rent but offering a meal to strangers. They bear longing and even pain– for lost soil, for absent loved ones– and still look up, seeing those around them who hunger and thirst. Even when my soul thirsts– when I grieve– when everything feels unsettled– will I extend a radical welcome? Fifty Arab teenagers faced a sand dune: enormous, steep, and scattered with thorns and stones. 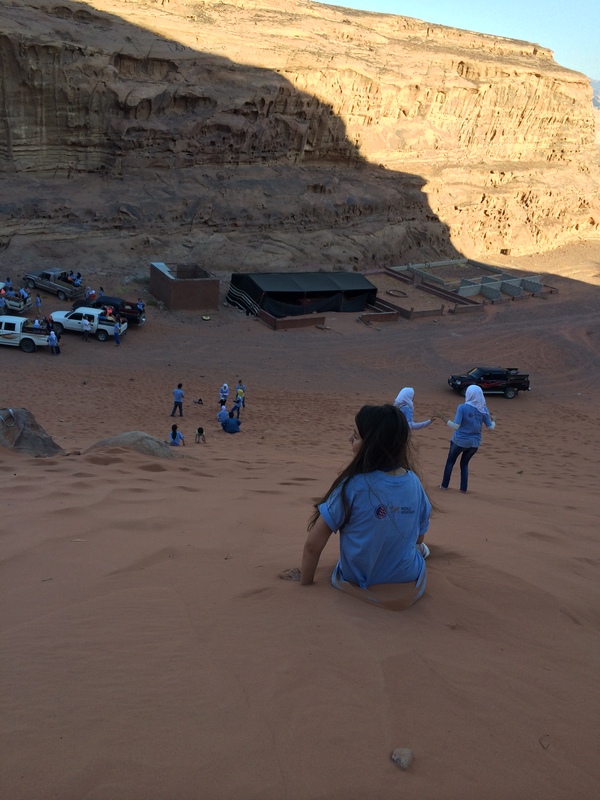 These girls were on a day trip in the desert, part of a week-long leadership camp, that would include games to build teamwork, group discussions on values, and dancing around a fire pit. 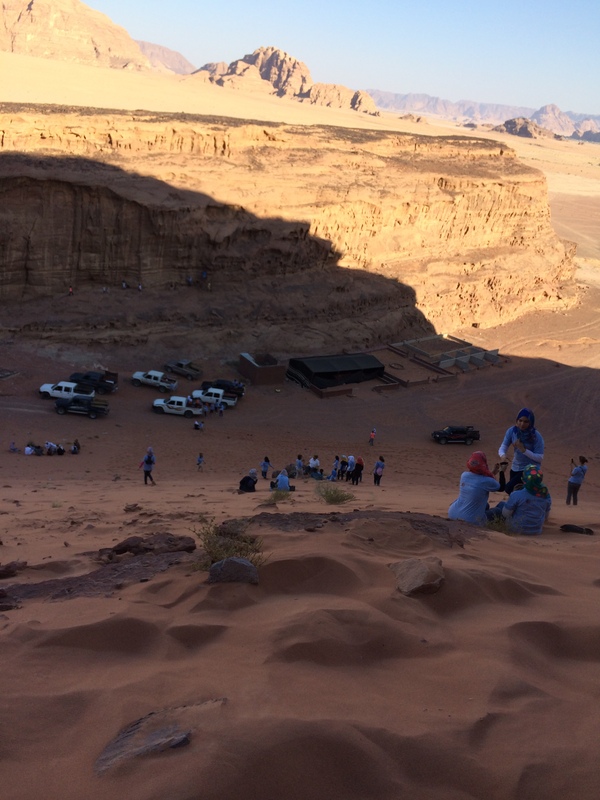 But the first adventure was not so organized– our Bedouin guides raced their Jeeps through the open spaces of the desert, and came to a stop at the bottom of a mountain of sand. Disembarking from the open pick-ups, the students knew what to do– and they were full of anticipation. Next thing I realized, Mara was leading me to the base of the sand mountain. We stumbled forward, arms linked, quietly laughing. We had come only a fraction of the way when we paused to recover. “Do you want to keep going?” I asked. The stumbles turned into falls– the dune was steeper past the base. This isn’t going to get any easier, I thought, looking upward. But Mara was focused. And a few rocks ahead might provide secure footing. For every step, I pushed with two legs, and Mara with her one healthy leg, but the loose red sands absorbed our shoes, socks, and ankles, sucking us backwards. Others on the mountain had started to notice our ascent. One offered to carry our bags. We were at the halfway mark. Those at the top– as well as those who had decided to halt somewhere along the way– started to call out encouragement. I wondered if Mara would feel embarrassed. She seemed not to notice, just keeping the edge of her mouth in a smile and her eyes on the sand in front of her. Three quarters of the way to the top. Mara asked me, “Are you tired?” Is she trying to tell me that she’s tired? I wondered. Our staggered steps were becoming less coordinated. Then we heard a voice above us: “You’ve got this!” We looked up. One of the other volunteers, a friend of mine, smiled and came to take Mara’s free arm. We had to awkwardly figure out how to coordinate as three now, but it was worth it– we inched upward again. Mara’s small smile returned. The girls at the top started chanting her name. Mara. Mara. Mara said little, but her smile had taken over her whole face. After a few minutes of taking in the view– which as Mara predicted, was MUCH better from up there– I started to wonder how she would get down. Most of the rest ran (it feels kind of like flying), and that would not work for her. Before I could ask, Mara told me what she wanted. A couple of others thought it looked like so much fun, that they joined her. I’m starting to see the connections. For example, the Arabic word meaning to remain with is connected to the word for to sit down. I get that. A word that starts as discussion can easily become the word for argument. Makes sense. And one of the words for working out also means… math? My mind is getting a lot more exercise than my body this summer, as community center activities take a hiatus and I sit with language teachers, studying word connections and sipping sweet coffee. So I decided to borrow a work-out DVD from one of my housemates. I’ve seen fit college athletes nurse aching limbs after one of these workouts: 30 Day Shred. Rob Reimer is a professor and pastor, and a person experienced in endurance of tough things. His teaching “hits me”/coaches me even from across an ocean. The truth is that amidst the summer stillness, I am restless for resolution– resolution of conflict in this region, of sadness of loved friends, and of longings in my own soul. Reimer reminds me, “…this time between the promise and the delivery of the promise is the most critical time in the life of the people of God. It is the “in between time. '” (Pathways to the King). I wasn’t sure I had a story this week. I am in between spring and fall semesters at the university, between Ramadan and the re-opening of the center, between being green and being seasoned, between hearing the promises and being able to grasp them with my hands. And tension resides. My instinct with this tension is the same as my instinct with Jillian Michaels’ Shred video: I want a different way, I want to get out of it. But stress builds change often, or at least creates the opportunity for it. And I’m beginning to see the connection. Here in the in-between, I spend my days studying Arabic and “shredding,” throwing away last semester’s worksheets to make way for new students, organizing my apartment to prepare for leaving it this fall to live a month with a local family… While I can see the end coming quickly to this in-between schedule, I don’t know when the resolutions promised will come. This stretch brings about change. And it’s there that I get ready for new opportunities, which I saw take place even yesterday… although that is a second story. For now, I’ll just say, holding arms wide open leaves me ready, giving or receiving, for an embrace.